The scared dog, was one of two that were dumped at a shelter, and as the footage starts she can be seen cowering in a corner. When she arrived at the Marin Humane Society shelter in California she was examined by a vet who realised she had recently given birth. A spokesman for the shelter said: "Yesterday, two frightened dogs were surrendered to us. "Upon examining the female, we learned she recently had puppies. 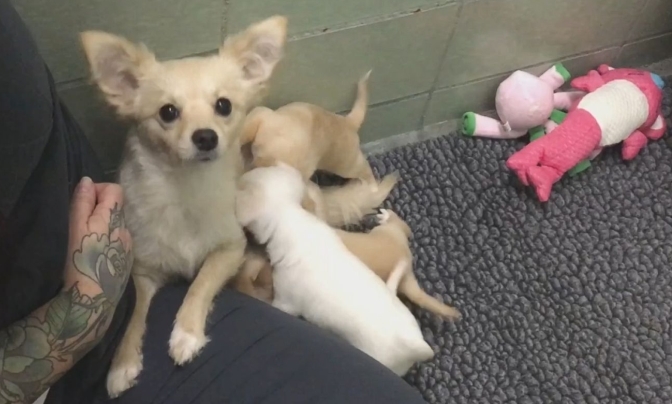 "After some detective work and a lot of convincing, our team was able to get the person who surrendered the dogs to also surrender the puppies, as they still needed their momma and were not in a safe situation. "Tears of joy all around at this happy reunion." As the clip shows the mum, now named Cora in on honour of Downtown Abbey, and her litter of puppies - Carson, Branson, Moseley and Edith were all ecstatic to be back together. Founded in 1907, The Marin Humane Society is a progressive, award-winning animal shelter, offering refuge and rehabilitation to nearly 8,000 animals each year through myriad community services, including adoptions, foster care, behavior and training, humane education, lost-and-found pet services, low-cost clinics, and more. Responses to "The heartwarming moment a sad mother dog is reunited with her lost puppies"